Unique Byron Bay Accommodation. 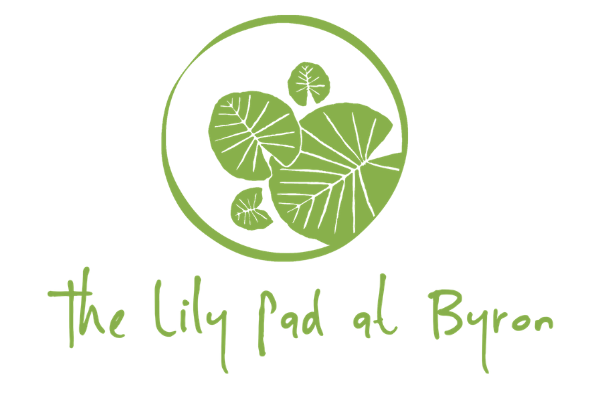 Book a stay at The Lily Pad. Two pavilions. Two ways to stay. Ideal for a couple or family. 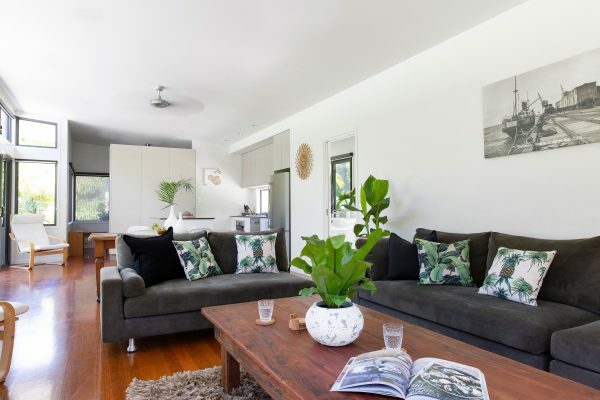 Set on a 50 acre tropical rural property just 5 minutes to town and the beach, The Lily Pad at Byron offers boutique holiday accommodation for a couple or a family of four. Hide away in your own private oasis or immerse yourself in the vibrant beach culture that is uniquely Byron. The choice is yours! With two architect-designed accommodation pavilions available, this unique property offers privacy, space and versatility. Couples will enjoy the serenity of the fully self-contained Studio pavilion. Families can be accommodated by the addition of the Retreat pavilion, with sleeping and living space for two extra guests which makes it ideal for teenagers. Only one set of guests stays at The Lily Pad at any one time, so your privacy is assured. 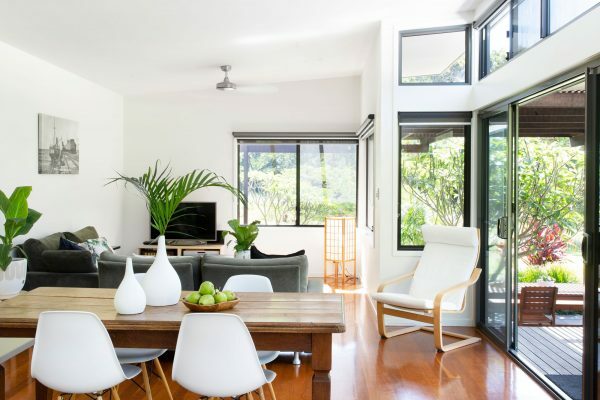 Fresh, white, open-plan living, nestled in lush, tropical gardens. The Lily Pad accommodates up to four guests in two architect-designed pavilions. The Studio pavilion has a light, bright and airy design, with separate living and dining areas, a fully-equipped cook’s kitchen and bathroom with outdoor access. A separate queen bedroom with built-in robe has views to the tropical gardens. The covered deck, BBQ and outdoor dining space with sun lounges complete the scene. The Retreat pavilion offers optional extra space for two additional guests holidaying with you. It features two king single beds, an open plan lounge room with TV and contemporary bathroom. 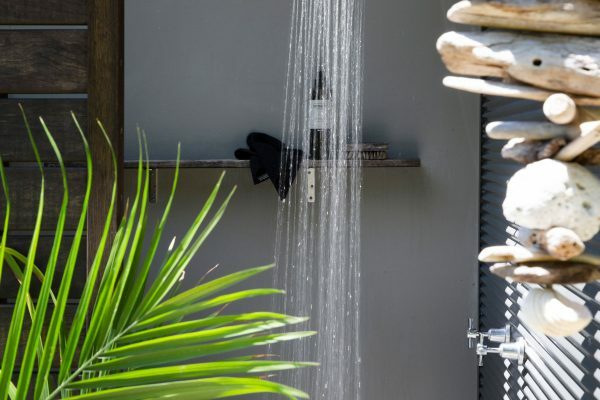 Behind the Retreat, you’ll find a fully-equipped laundry and custom-designed outdoor shower with views to the trees. 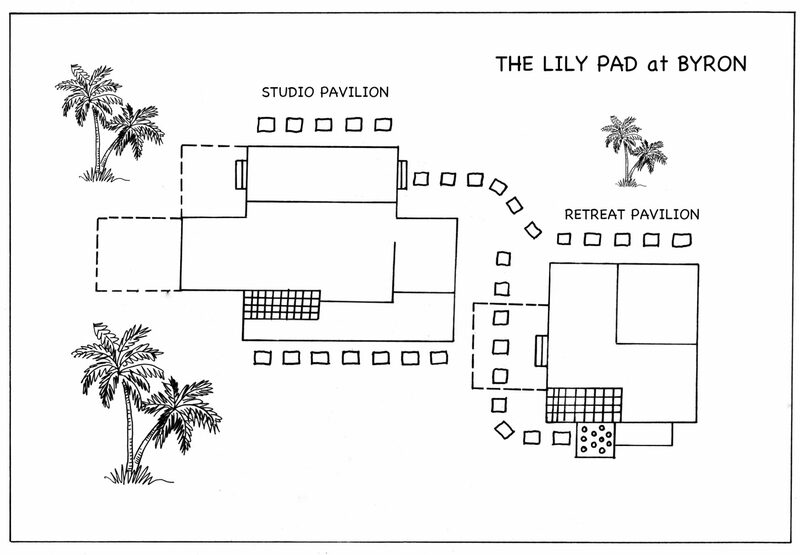 The Studio pavilion is the hub of The Lily Pad and provides accommodation for one couple. 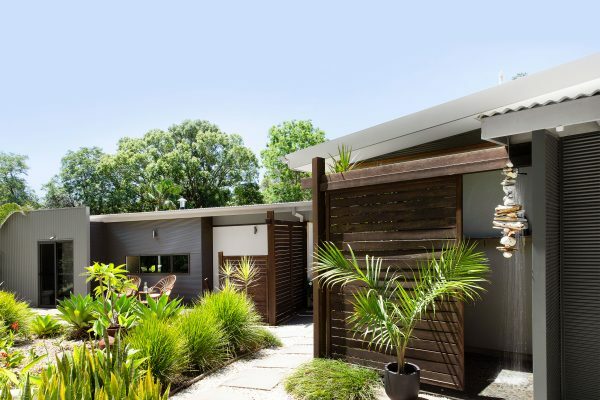 Overlooking tropical gardens and expansive lawns, this architect-designed, self-contained space features a contemporary, relaxed interior. The Retreat pavilion offers optional extra sleeping and living space for 2 additional guests. It complements the Studio perfectly, making it ideal for teenagers or other family members. Meandering stepping stone pathways provide easy access to the Studio and Retreat pavilions. External sensors ensure the entry is well-lit at night. 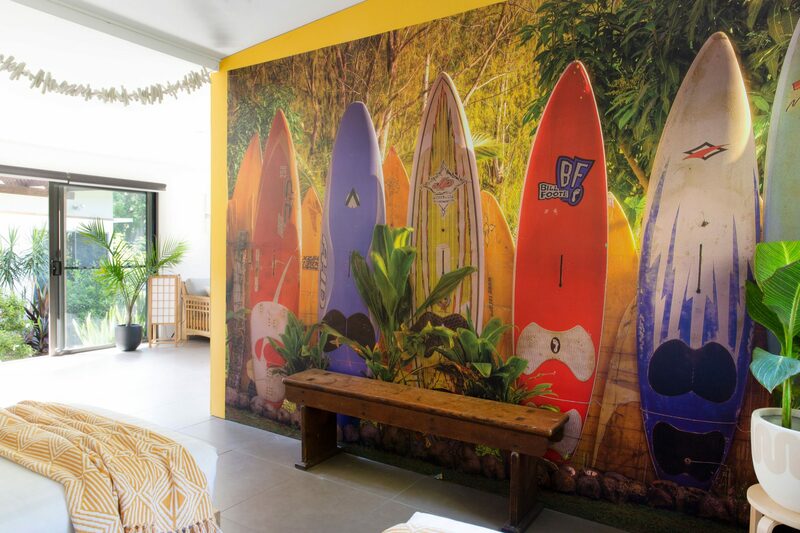 The Retreat pavilion features 2 king single beds overlooking a funky surf mural, contemporary bathroom with shower, and separate lounge room with TV. 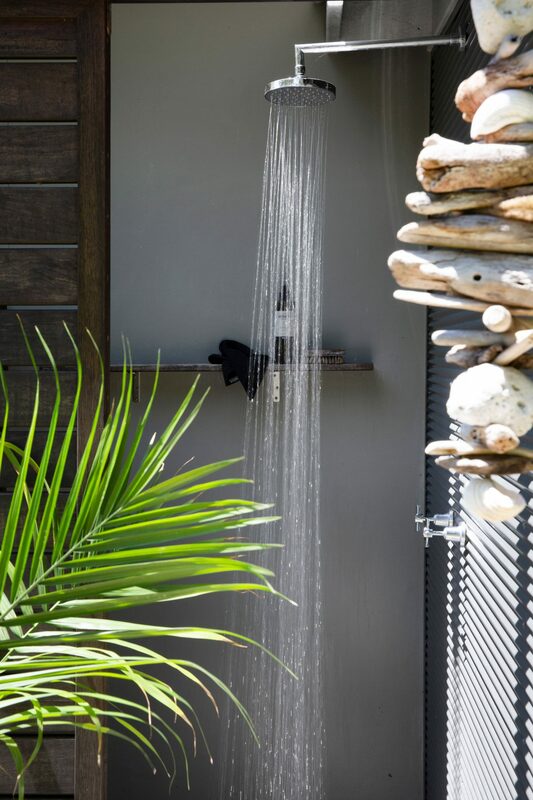 The custom-designed outdoor shower features hot and cold water, sliding timber privacy screen and pebble stone floor. The fully-equipped laundry includes a washing machine and clothes dryer, plus full-size clothesline nearby. The Studio pavilion has a separate bedroom with queen bed, built-in robe and views to the tropical gardens. Quality timber furnishings and a latex mattress ensure a peaceful nights’ rest. Kick back in the cane deck chairs as you enjoy a drink overlooking the tropical gardens. This covered outdoor space is perfect for relaxing and reading. The airy, open plan design offers a full cook’s kitchen, separate dining and lounge room, and bathroom with outdoor access. 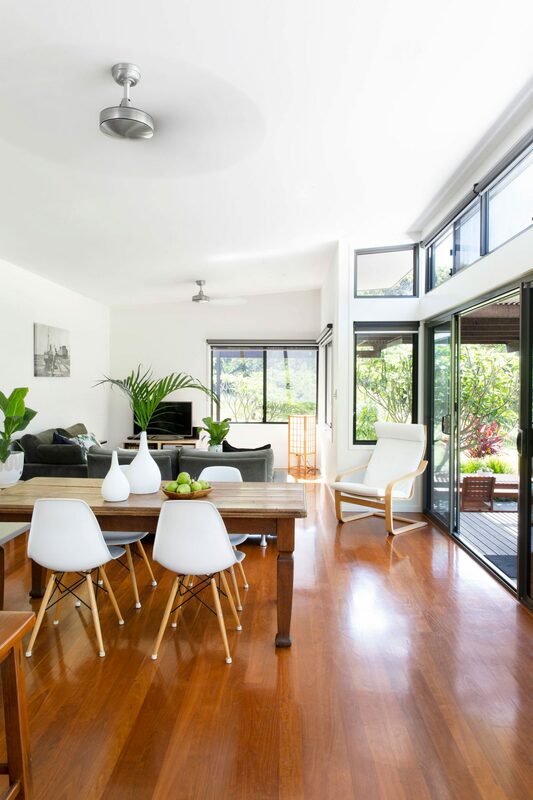 Floor to ceiling sliding doors provide access to the deck and offer panoramic views. The outdoor living area is located under the timber-slatted awning and includes a quality Weber gas BBQ, teak outdoor dining table and two teak sun lounges with cushions. Frangipani trees and tropical gardens frame the views. The Lily Pad is bounded by tropical gardens and expansive lawns. Wander behind the Studio to the cool meditation zone under the old mango tree. This is our third stay at Lily Pad and it will not be our last. For us this is quite simply the best place in Byron...! Thanks for such as beautiful and relaxing stay. So appreciated the extra effort providing surprise cupcakes for a birthday getaway. Thank you for a wonderful stay. The Lily Pad is absolutely gorgeous. The gardens and a peaceful oasis after the chaos of Byron! They are so pretty and full of fantastic birds. Both the studio and retreat are fabulous and make for a great family holiday. What a fabulous oasis of calm & tranquility this place is. Loved the garden, birds, wallabies and the frogs. Enjoyed exploring Brunswick Heads, Mullumbimby Farmer's Market (the best! ), Bangalow and Newrybar (loved the Harvest Cafe there), discovered The Balcony Bar for the best cocktails, the hole in wall taco place (Chihuahua) and great Vietnamese Street food near Woolworths. Thank you for sharing your gorgeous pad. Lily Pad is an oasis with a beautiful garden, masses of birds and wildlife. We hope to back again soon. It was such a peaceful place to come home to after a day of exploring all Byron has to offer. We had such a wonderful stay at The Lily Pad. Do yourself a favour and book a stay here! The experience was brilliant. Nicest place I have ever stayed. It's a great place to wind down at the end of the day, with absolutely everything you could ask for in a property. We had such a wonderful stay at The Lily Pad. Conveniently located just a short drive from town down a lovely picturesque road. Only a 3-4 min drive into the heart of Byron. It was a perfect spot to rest and relax but still be close to the action. Lily Pad was a stunning property... quietly nestled in amongst a natural setting. Enjoy the best of both worlds at The Lily Pad. You’ll be close to town, but far enough away. The Lily Pad at Byron is located just 2.5 km to the heart of Byron Bay and Main Beach. 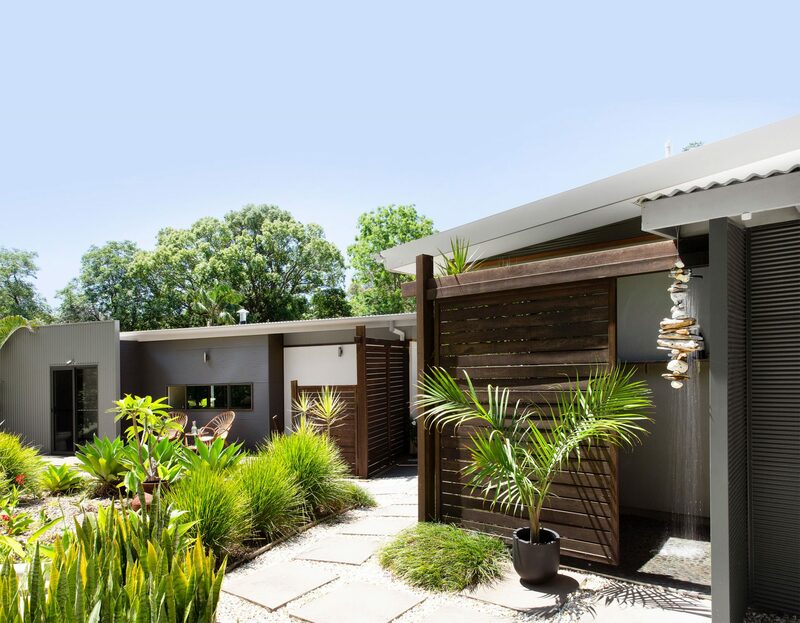 It’s a tranquil oasis hidden amongst the trees, yet so close to Byron’s famous beaches, shops, cafes and restaurants. It’s truly the best of both worlds. 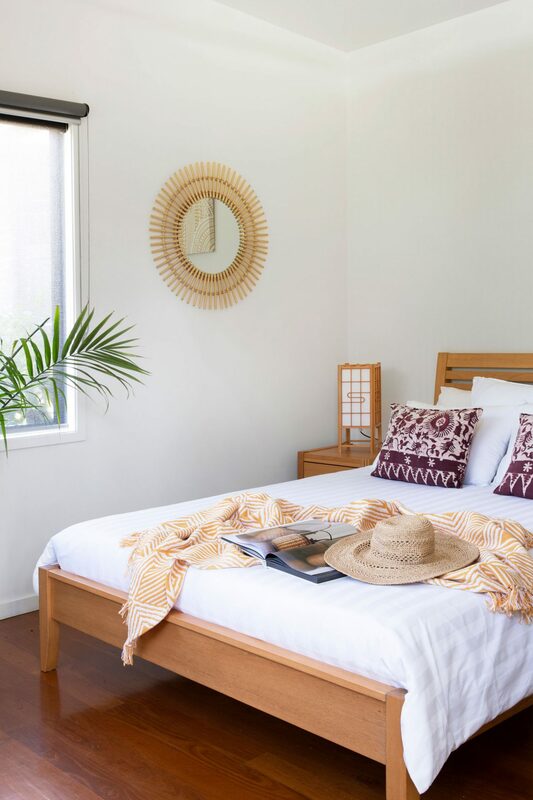 Hide away in your own private tropical retreat or immerse yourself in the vibrant beach culture that is uniquely Byron. The choice is yours! Plan your stay with this detailed Google Map which includes our local tips on places to visit. 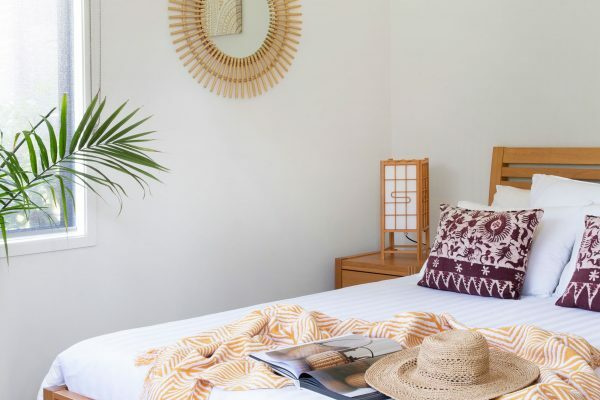 Time your stay with one of Byron Bay's many markets, special events and annual festivals.